I’m not sure if what I’m talking about is actually a choker, I guess a choker’s just a tight necklace of some kind so yes, yes it is! I never really saw myself as a chocker lover and when the trend came out I have to say I put it down to a trend for teenage girls and thought nothing more of it. The constant girl crush that is Danielle Bernstein has brought it back to my attention recently through the gift that is instagram and I have to say, I’m liking it. Maybe it’s just the way she wears it, maybe it’s just the way she wears anything? 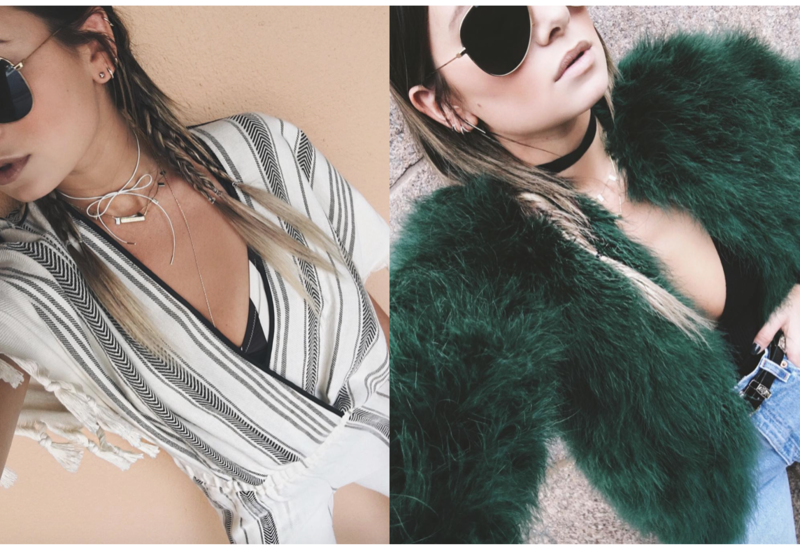 Firstly, I love the choker from Rumi Neely’s brand AREYOUAMI and I’m pretty sure thats the one I’ve got my heart set on, but I also love the velvet ones. Either way my favourites are definitely the ones that tie in a bow – it makes it less harsh and they also look great layered a la Danielle Bernstein.Photos taken from Danielle Bernstein’s Instagram Account ‘weworewhat’ I’ve linked some of my favourites below that I would buy if I had the money, however money is becoming an issue since I’ve booked travelling and then my car insurance decided to come out the week I didn’t get paid so I’m contemplating a homemade one. I mean how hard could it be? If a ribbon would work then I may be able to steal some from my sisters workshop whilst she’s sleeping (unless she’s reading this) if not, leather from a haberdashery shop? Watch this space! Don’t forget to follow me on Bloglovin’ to make sure you never miss a post! And of course if I do find a DIY alternative I will share it with you guys! If you follow me on any form of social media then you’ll be all too aware that I’ve been bed bound with the flu for the past week (and still going) so it will come as no surprise that I’ve decided to do a few inspirational posts. i.e. – posts I can do without taking my own photographs! I can’t lie, I do always love doing these posts but just a pre warning here, they are extremely dangerous to the bank account, unless of course you hate my style in which case. . why are you here? Anyway! Here’s some of the winter coats I’ve been loving on Pinterest at the moment, including these insane fur coats, I’m in love. Please please please can Zara do another amazing Acne dupe but in fur? this one is too amazing! Love the idea of a fur bomber! Who doesn’t need a camel coat? Investment piece right? Love the ankle duster styles though with my lanky legs I’m going to have to go to somewhere like long tall sally to achieve this look! I’m pretty sure I’ve got one of these on the way in the post – oops! I’m so excited about the next part because I’ve learnt to do something so cool! you can click on the pictures (or plus signs if they’re still there? I’m working on getting rid of them!) and it will take you straight to the coat I’ve got a picture of! Seriously proud of myself for learning to do that (it was not hard). Anyway, these are my favourites, love the mink coloured fur from Forever 21! I’ve also put them all together below! Make sure you follow me on Bloglovin, I’ve got so much exciting stuff to come when I’m well enough to shoot so you don’t want to miss out! I don’t know if you’ve noticed (you definitely have) but I’m just a tad on the obsessive side when it comes to the colour khaki. I can’t stop buying it, I have issues and I need to know, is it okay to wear a khaki coat with a matching jumper and matching shoes? Anyway, seen as it’s all I love at the moment I thought I would do a post dedicated to my colour of the moment and truely indulge in some khaki lovin’. All of the images are taken from Pinterest, you can follow me here (did you like how I slipped that in there?). I’ve also just found out that all of my images across all of my posts are pinnable – so make sure you pin away!And what inspirational post would be complete without a wish list? I can’t lie, I do enjoy putting these wish lists together far too much! Missguided Brushed Wool Coat Khaki – £45 Missguided Padded Bomber Jacket Khaki – £35 New look Tencil Military Shirt – £22.99 MEGAN X ASOS TOPS Suede Belted Shirt – £65 Missguided Peached Belted Trench Coat – £45 Boohoo Belted Shawl Collar Coat – £50 Asos Shift Dress in Suedette with Rib Neck and Pockets – £48 Missguided Oversized Shirt Dress Khaki – £22 Asos the Ultimate Swearshirt with Pocket in Cotton – £16 Asos Lace up A-Line Dress in Knit – £38 New Look Khaki Ribbed High Neck Jumper – £19.99 Boohoo Bea Military Pocket Oversized Shirt Dress – £20 Do you guys have a favourite colour that you just can’t get enough of?! Don’t forget to follow me on Bloglovin’ for all of my favourite things, inspiration and outfits! Pretty much everything I’ve brought in the last few weeks is missing one vital ( or not so vital) piece, the shoulders. i don’t know what it is about a top with no shoulders that get’s me so excited but I’m just loving it right now. Even with a pair of jeans they look super summery and in a dress or playsuit it’s just ir – es – ist – a – ble !! There’s nothing like no shoulders that says SUMMER, honestly guys, you heard it here first, shoulders are so last season. So since I’m totally obsessed I’ve currently got baskets brimming here there and everywhere with shoulder-less goodies on every site you can think of. I thought I would share my cold shoulder love with you guys and pick out some of my favourites on the web!